I'm not sure the last time I made cinnamon rolls that didn't involve popping the pressurized can open with a spoon and hoping that it didn't ooze on me. It is cold and snowy in Denver tonight and after getting home, I had no interest in going, doing or being anything outside the house. This recipe maybe falls under the 'semi-homemade' category since I did use Jiffy baking mix. Super easy and required about only 5 ingredients. Preheat oven to 425. 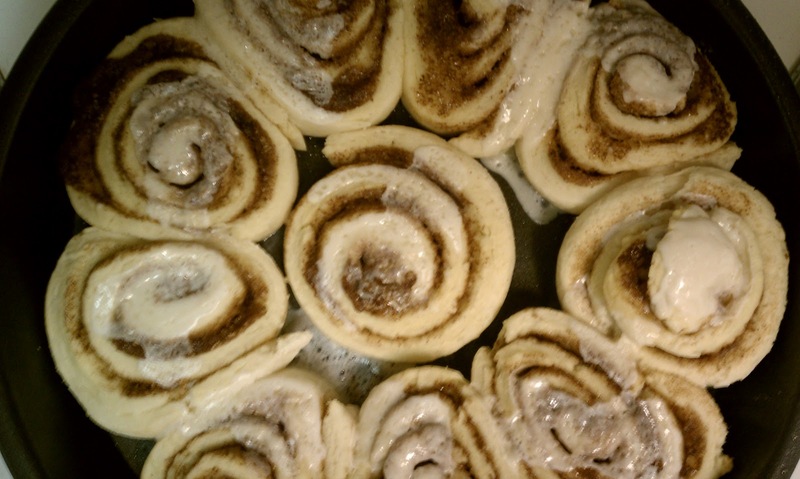 I sprayed a round cake pan...the way I cut these rolls, there was no way I was making 15. Blend baking mix and milk. Turn onto counter dusted with baking mix and knead about 20 times. Roll to 15 x 8 rectangle (I did break out the measuring tape to see if I was even close). I melted the margarine and painted it onto the dough with a pastry brush then sprinkled the sugar/cinnamon mixture. Roll up and slice into 1" pieces. Place in pan. Bake 15 minutes. Serve warm. Frost if desired.